Amenities: Weston’s unique rural, yet sophisticated, environment boasts an absence of busy commercial boulevards. “The Center” as the locals fondly call it, is the go-to place to shop and to meet. There one can find the local food market, a bank, pharmacy with gift store, dry cleaners, real estate office, post office, spirits shop, hardware store, restaurant, and gas and service station. Culture: Weston has an active arts scene. The Weston Commission for the Arts organizes music, art, drama and other valuable cultural events. Weston Library offers a variety of programs, book clubs, and workshops for residents of all ages. An active Senior Activities Center runs a wide range of programs, which include yoga and fitness, knitting/crafts, and much more. Recreation: Parks and Recreation provides a wide choice of activities and camps for residents. In addition, the indoor pool at Weston Middle School is open to the public year round. Bisceglie-Scribner Park, a 53-acre recreation area, contains Little League fields, picnic facilities, a swimming pond and the Kiwanis Fitness Trail. Aspetuck Country Club, Weston Field Club, Weston Gun Club and Weston Racquet Club provide residents with ample opportunities to enjoy tennis, golf and private club membership. Open Space: Almost one quarter of the Town is permanently devoted to open space. Whether the northern Nature Conservancy – Lucius Pond Ordway – Devil’s Den containing 1,765 acres, or Katherine Ordway Preserve containing 60 acres on the east side of Weston, or 645 acres of Aspetuck Land Trust sprinkled around the Town, every neighborhood can claim some piece of recreational land nearby. Country Fairs & Farmer’s Markets: Emanuel Church and Norfield Church are famous for their fairs. The Grange Fair at harvest time is another popular event, along with Weston Elementary and Weston Intermediate School’s PTO’s Memorial Day Fair which is a draw for the entire region. Each year the Fair follows an old fashioned Memorial Day Parade, which is hosted by the Weston Volunteer Fire Department. After the parade, all can have free hot dogs and soda. A popular Farmer’s Market is held on the grounds of the Coley Homestead at the Weston Historical Society on Saturdays from May through September. The Weston Grange is host to a “Winter Market” from mid-November until early May. Community Involvement: Weston has a long history and reputation for community volunteerism. 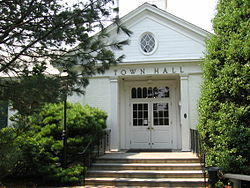 The citizens devote countless hours to serving on Town boards and commissions. The Volunteer Fire Department and EMS Squad rank high in their commitment by providing extraordinary service to Town citizens when in need. The Weston Historical Society, the Kiwanis Club, the Weston Women’s League, the Weston Garden Club, and the League of Women Voters are just a few of the organizations that regularly dedicate themselves to improving the Town. Weston is a warm and inviting place for those who enjoy being a part of their community.